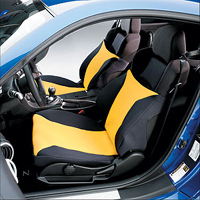 Custom-tailored protection for car seats. Styling and comfort… SeatGloves feature a panel of 1/8 inch thick high-breathability fabric to keep you cool, surrounded by a form-fitting stretch fabric border with the look and feel of neoprene to protect the high-wear areas of the seat. SeatGloves provide cool comfort on bucket and sport seats. SeatGloves' high performance breathable fabric is made form proprietary fibers that provide great air flow, even when wet. The fabric is designed to pull moisture away from the body and into the fabric, where it can easily evaporate. Driving on seats or seat covers that are not breathable can really heat things up! The superior evaporation properties allow you to cool off faster, yet your seats stay dry because the SeatGloves allow moisture to quickly evaporate. For active people, SeatGloves are a great way to protect your upholstery. SeatGloves are sharp, stylish additions to any vehicle. You stay dry...you stay comfortable! PLEASE NOTE: SeatGloves are not complete seat covers. See example glove on the upper right. The covers do not go all the way up to the headrests like traditional seatcovers. SeatGloves are available in 5 colors. All SeatGloves have black side panels. Price listed is for two seat covers.